Take this short survey and get a free pergola plan. The benefits to learning how to build a pergola for one of your first DIY projects are its simplicity in design, cost, and time it takes to build from start to finish. You can easily give your back yard some personality and character. Just a simple pergola adds that sense of warmth and relaxation that we all want in our home. Some of the more popular uses are for deck and patio covers. These are called attached pergolas. They just have supporting posts or columns on one side and the other side is attached to your house. A freestanding pergola like the one above would not be attached to a structure. It has a full set of posts and support beams allowing it to placed anywhere in your yard, most likely to shelter a seating area, spa or hot tub, garden, or even serve as car ports or garages. A roof pergola could be attached to the top of a wall, fence or gate rather than secured into the ground to provide a more defined entryway into your front yard or other areas of your property. A backyard garden pergola could be a place to grow and display your favorite vines. Planters can be attached between the posts for you to place and display your flowers. It can designate areas of your property by covering a spa, for example. You can have a pergola with walls, much like a gazebo. You can even build it around your outdoor kitchen to serve as the grill area. For those who are planning a backyard wedding or reception, having a wedding pergola is the perfect look you’ll want to wow your guests with. These make perfect picture shots, too. As you start to look into how to construct a pergola, you will find many places with free plans to help you get started. You can do that right here on our own home page by signing up with your email. 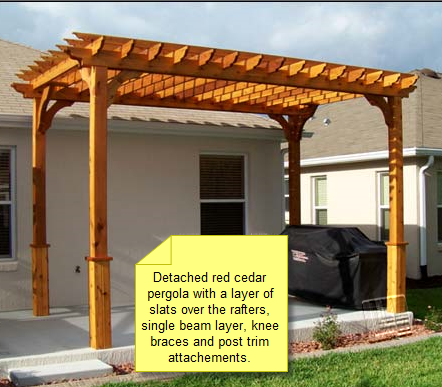 There are also many resources available to help you customize your own pergola plans. With very little prior woodworking or building experience, you can easily build a pergola on your own. 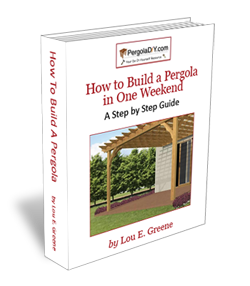 Join 500 homeowner’s and receive our lesson plan on preparing to build your own pergola. Please sign up with your email on the banner above or in the box below and take our survey.